This week is a recovery week and only 4 miles today with a lighter pack. Early morning dew saturated spider web. 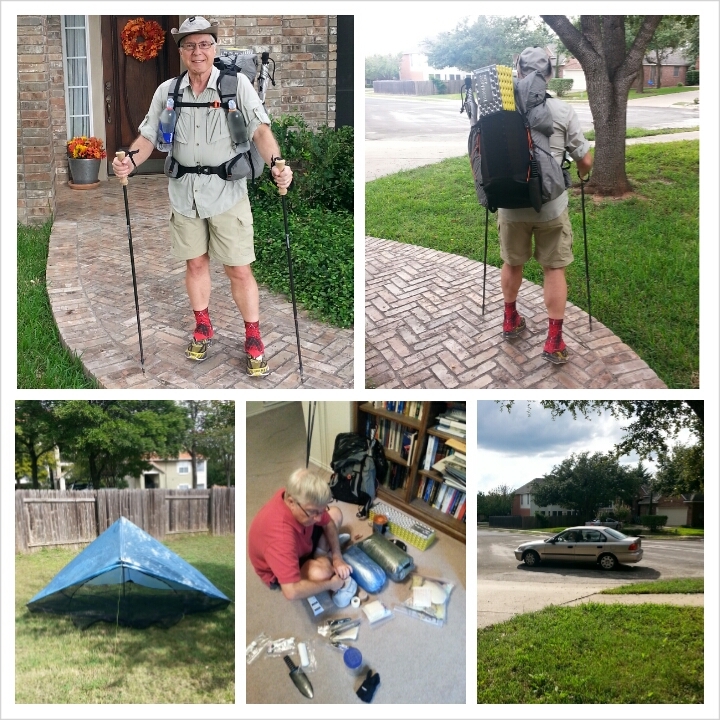 Well as of today I have purchased my major gear: pack, shelter and sleeping bag. 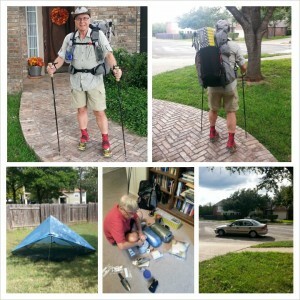 Respectively, Gossamer Gear Mariposa Pack, ZPacks Hexamid™ Solo-Plus Tent, and ZPacks™ 900 Fill Power Down Solo Sleeping Bag – 20 Degrees, Medium Length, Wide Width. The former I have, and the latter two have been ordered. Now I have to learn to operate with them efficiently. 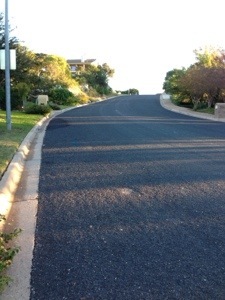 Twice a week I do hill workouts. Typically I do Ladera Norte on Thursdays. 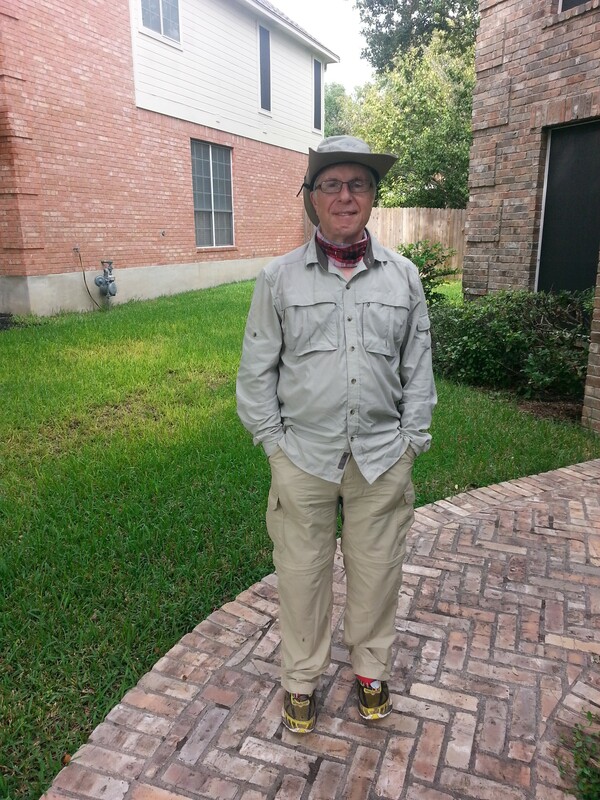 Today I got all dressed up in my new hiking outfit: hat, shirt, and convertible pants/shorts. 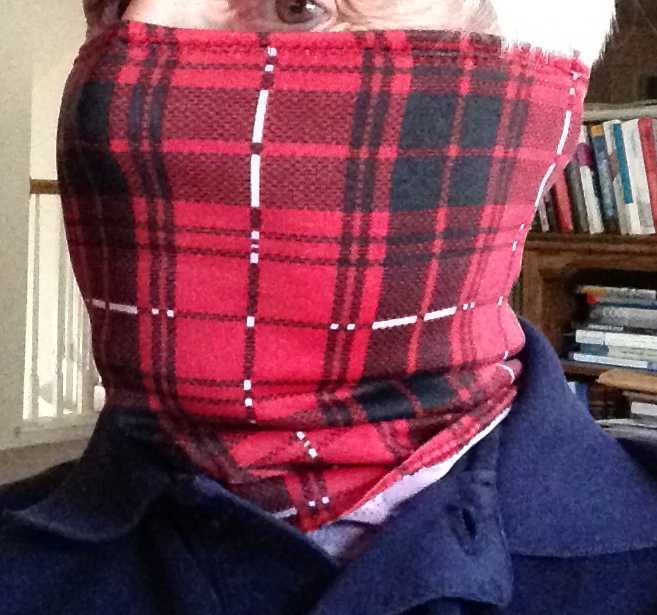 I even wore my new plaid gaiters and buff that I made myself. I looked like I just walked off the set of some Australian movie. Ha! 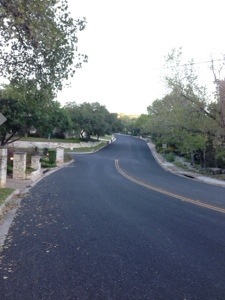 Since my running days I’ve known about this steep road which gains about 400 feet in 1/2 mile. I thought it would be good to hike it with my ever-increasing-weight pack (now at 28 pounds). 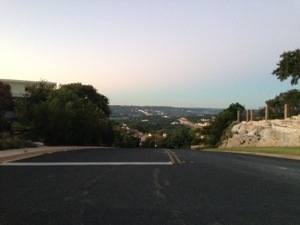 I wish it were more of a hill, but it’s the best that I’ve got in Austin which is an easy drive from my home. So I park my car and start on Far West Blvd which steeply descends down for 1/2 mile to the start of Ladera Norte. It goes up then flattens out a little and ends with a short up. By the time I get to the top I’m huffing and puffing. Yet over time it seems to be getting easier, but I could just be fooling myself. From the top is a nice view of the Austin hills. 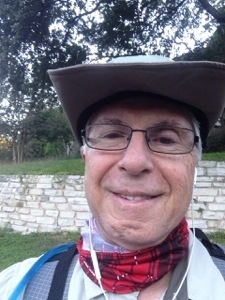 Once past the steep Ladera Norte portion it is flat for 1 1/2 miles to loop back to Far West Blvd (for a total of about 2.7 miles) and I’m ready to do it again. Today I did three loops for just over 8 miles in 160 minutes or 20 minutes a mile. A tad slow for me. But I ate my breakfast as I hiked and I stopped a few times to take these pictures. The Austin Backpackers Meetup had a weekend backpacking trip this weekend to Lake Somerville State Park. 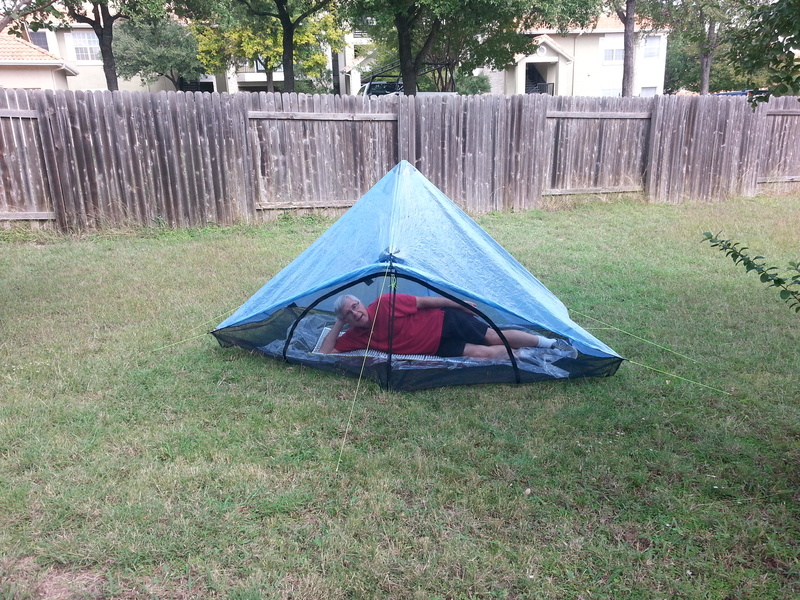 I just received my new tent and sleeping bag so I was excited to try them out. And I sure did. So on Thursday and Friday morning I sorted, selected, and packed my pack with all the stuff I’ve been buying and was ready to go. I even created a spreadsheet of each item along with its weight in grams to figure out my base pack weight of 12.5 lbs. Then I was ready to go. Here I am on our front walk. Katie recorded the event and created this photogrid. There were eleven of us, and it was a great group of very nice people. Some of us were newbies like me that didn’t know what they were doing and some of us were old-hands who were very helpful explaining things to the newbies. it was a good combination. 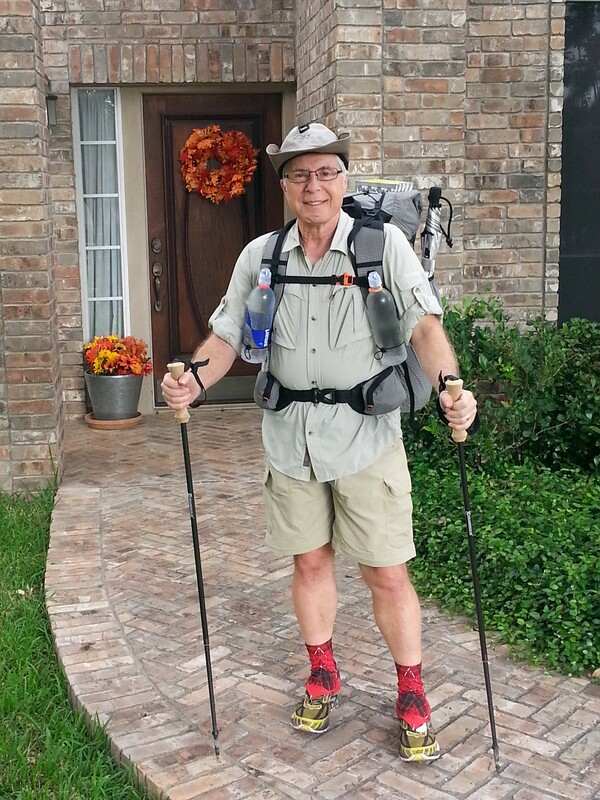 We arrived and stayed over that Friday night at the Nails Creek unit of the Lake Somerville State Park and Trailway. Then on Saturday we packed up, drove two cars to Birch Creek unit and headed out on the trail way, hiked about 8 miles to Newman Bottom in the back country and stayed over night. That night we had a tremendous rainstorm and many of us got soaking wet. I was lucky and woke to the distant lightning flashes at 3:30 AM and got prepared, but I still got quite damp just sitting on my pad and getting splattered on. Then on Sunday we packed up amid the rain, left there and hiked back about 6 miles to Nails Creek to our cars. Afterwards I volunteered to shuttle one of the hikers, Bryan, to his car back at Birch Creek and then I headed home. Overall I was a tired but satisfied backpacker afterwards. Pack. It worked well. However I need to adjust the sternum strap and make it shorter. The shoulder straps are pinching my arms as I swing them. I need to figure out how to attach my sleeping pad better. Maybe use mini bungee cords. Instead I adjusted the cord to hold my pad on the back by getting rid of the center “X”. Poles. They were fine. Because they are also used for the tent I needed to adjust their length each day which is a bit of a pain and sometimes difficult because they stick internally. 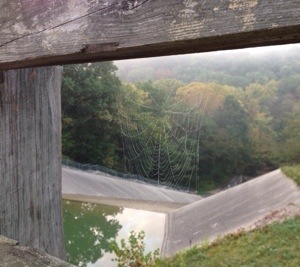 Also be careful crossing wooden plank bridges to not catch a tip and break a pole. Pack Cover. It wasn’t used. Even though it rained and I took it out and put it around my pack by then the rain had stopped and I put it away again in its tiny stuff sack. Pack Liner. A garbage bag, ripped the first time I used it. So I went without one. I need to get trash compactor bags. They supposedly are stronger. Tent and stakes. They worked fine. I accidentally poked a hole in the mesh with the hiking pole and have ordered a spare piece of mesh to repair it. 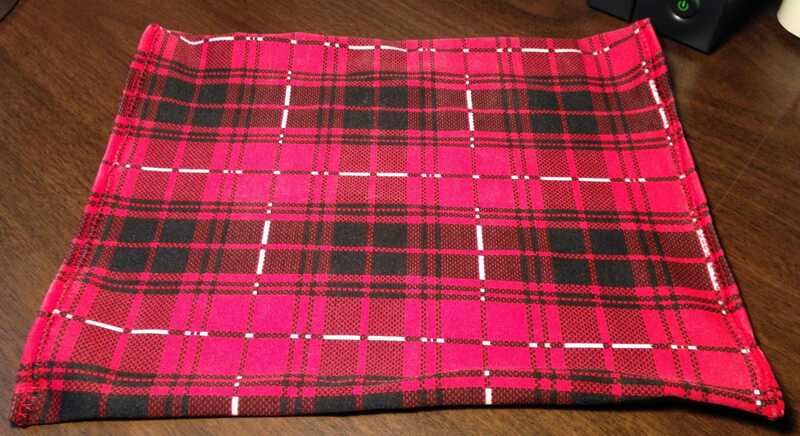 Ground cloth. It got wet a lot. Then it would all sick together because it is so thin. It worked, but it’s probably not the best for the Hexamid. I have ordered a ground cover from Zpacks which is a “tub”, attached with clips to the tent and should prevent more splatters. Sleeping bag. Overall it worked and was probably too warm out to use it. The first night it got damp and I was able to hang it up and dry it out later in the day. The second day was even hotter so although I unpacked it I slept on top of it using only the liner until later in the night it was cool enough to use it. Then just before it rained I packed it away to insure that it wouldn’t get splattered on and I’m glad I did else it would have gotten soaked. I definitely need that ground cover tub. So just before the rain when my bag was packed I was glad I had my down vest, and wool cap. Sleeping bag liner. Big and easy to sleep in. Very thin material which is somewhat hard to pack away. I’ll never get it back into its original tiny weeny sack. It worked, but I found that since I was sweating a lot and didn’t wash that my legs would stick to each other which was uncomfortable. This is not fault of the liner, but just a comment. Sleeping Pad. Since I sleep on my side I was somewhat uncomfortable on this pad. It is too thin and hurt my hips. 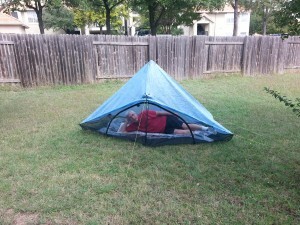 One of the other campers had a Inertia X Frame air mattress by Klymit and recommended it. It weighs about the same. But because it is an air mattress I’m worried about punctures. My sleep is important to me. Jetboil. Worked like a champ. Fast, easy, and convenient. Don’t know if I need all the miscellaneous parts, for example, the tripod stand. More stuff to carry, and more stuff to lose. Alcohol stove. Left at home. Lighter, matches, jar, utensils, and cleanup cloth. Didn’t use backup lighter, and matches. Used jar for other things than preparing food. Used spoon only. So could do without knife, fork and second spoon. Used cleanup cloth and it got grungy so I turned it inside out. Probably need water and soap to wash and rinse it out, because oils got into it. Hat. Wore it throughout. It’s a bit warm in the hot weather. Down Jacket. Never took it out of the sack, but did use it for a pillow within the sack. Need to deal with making a pillow of some type. Rain Jacket and pants and umbrella. Didn’t use them personally, but after the rain I lent the jacket to Shannon who was cold. Down vest and pants. Never took it out of the sack, but did use it for a pillow within the sack. 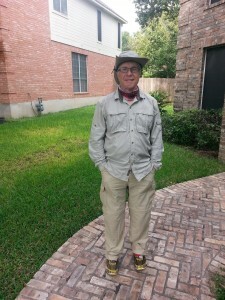 I used the vest after packing my sleeping bag before the rain on early Sunday night. I have come to consider that if I’m trying to sleep and I’m cold that instead of toughing it out I should wake up and solve the problem so I’ll be better able to relax and sleep. I did this by using the down vest, wool hat, and wool gloves at different times during the weekend. And it wasn’t really that cold. By the way the wool hat helped me sleep against the sack because it provided a better surface to rest against instead of the smooth plastically stuff sack surface. Shirt and pants. Wore them throughout. Slept in the shirt and underwear. I need a separate sleep shirt. Expecting the Patagonia shirt for this. I do however need to separate sleeping from non-sleeping and I was expecting the Patagonia shirt to be my base layer. The pants got stained by my wearing brand new running underwear under them and the dye bleeding onto them. I liked the ability to convert them to shorts which cooled me down. Long underwear top and bottoms. Patagonia shirt is on order and should arrive shortly so I didn’t have it on this trip. I wasn’t planning on buying long underwear bottoms. Underwear. They were fine, but I’ve got to remember to prewash them several times before using them. They were brand new and the sweat caused the dye to stain my pants belt-line and crotch. Well I wanted my stuff to look used and now the pant definitely do look that way. Dress socks and toe socks. I didn’t bring dress socks. I brought toe socks. They were OK, but I don’t know if I need the actual toe separation. Also the dress socks might be too high on my calf. Shoes. I used my old trail running shoes. They were quite smelly after the trip because of the rain and trail moisture. I think they are nearly worn out. 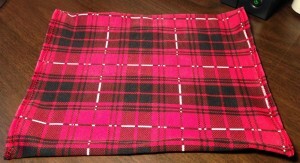 Plaid gaiters and buff. The long pants covered my gaiters so they were less useful. Wetting the buff helped cool me down, but once it dried out the dry buff was like a hot little scarf on my neck. Sunglasses. Used them on Saturday in the bright Texas sun. I am worried that since they are not wrap style around that they will be a problem in the snow. Warm gloves, hat and socks. 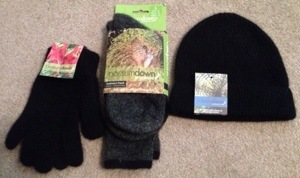 Used the hat and gloves during times at night. The socks were too much for the two nights and just stayed in the sack. By the way I didn’t bring any light gloves. Handkerchief. This is a necessity. When exercising my nose drips and I need this to keep me happy. Water Purification. Used the Sawyer squeeze. Needed to “burp” the SmartWater bottle to put air back into it as I drank the water up. Water bottles. I used the 0.7L SmartWater exclusively. I used the 2L Platypus bottle for filling other bottles. Overall I used about 4-5L over the trip for drinking and cooking. Toothbrush, paste and dental floss. Used them twice each day. Pills. Took one each morning. Almost forgot on the second day. TP and trowel. I didn’t use any TP, but instead used the Park’s facilities. Ear plugs. Forgot them and should have brought them. Friction creme. I didn’t use it. Probably should have used it. Needle, garbage bag, bug repellant, sunscreen, and needle. Definitely needed the DEET and Sunscreen. All the rest I didn’t use. There were trash bins at the park I used. First Aid. No need for any first aid. Put bandage in its own zip-lock. GPS Watch. Use the GPS the first day, but forgot the second day. Also it was running low on batteries by then. Cell phone. Had it in Airplane Mode (over one day it only decreased from 100% to 98%), but when I saw the lightning I turned it on and went to KVUE.com to see the big storm coming towards us. All the other technology I had either left at home or in the car. Miscellaneous. Used my trail light a lot when sitting at the camp table chatting with everyone. Used my Flea light on low in my tent hanging it on my hiking pole strap. 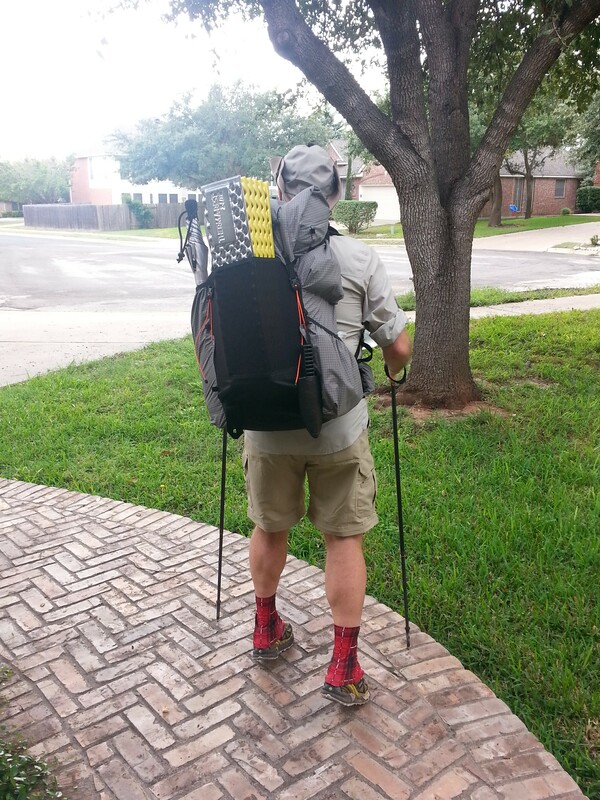 The hiking pole strap was my main hanger in my tent and held my glasses, light, and watch. Food. Breakfast was great. Lunch and dinner were awful. I brought some dehydrated crap for lunch and dinner and it was just unappetizing. I ate it, but I was not happy. My flavor palate is familiar with certain things and I’d like to just have the same food on the trail too. Breakfast is easy, but I’ve got to work on lunch and dinner. Maybe I’ll need to get a dehydrator. OK, that’s all I have to say for now. I have a great idea for you. 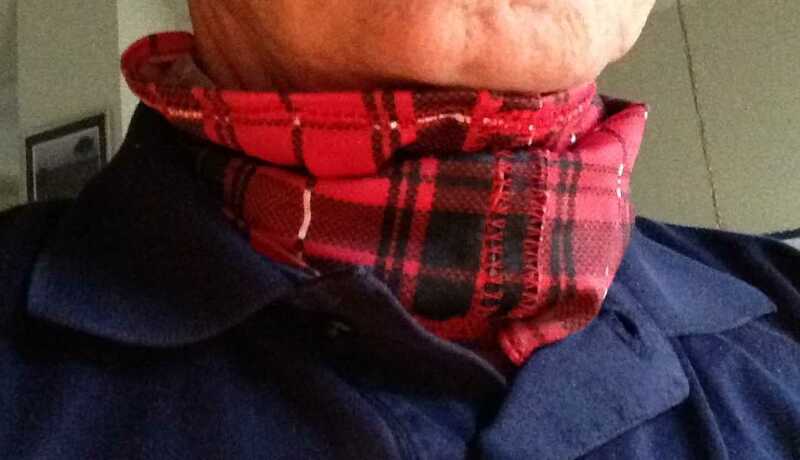 You could also offer matching Buffs with your product line. The Buff would be a tube about 11 inches long and 8 1/2 inches across when laying flat. or in dusty situations you can cover your nose and mouth. 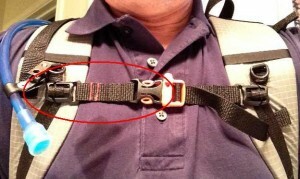 Quite a useful accessory for any hiker. Oh, and they are easy to make. On Tuesday I finally switched over to my new Brooks Cascadia 8. These new ones are size 9.5 which is one size larger than my normal. I definitely felt the difference with them being much gentler and softer on my feet. I just wanted to let you know that I was having a problem with my Gossamer Gear Mariposa’s sternum strap. I could not get it tight enough and thus the outside of my shoulder straps were pinching the flesh in front of my arm-pits. The elastic strap material and the length of the strap was just too long and I couldn’t adjust the whistle-side any more. 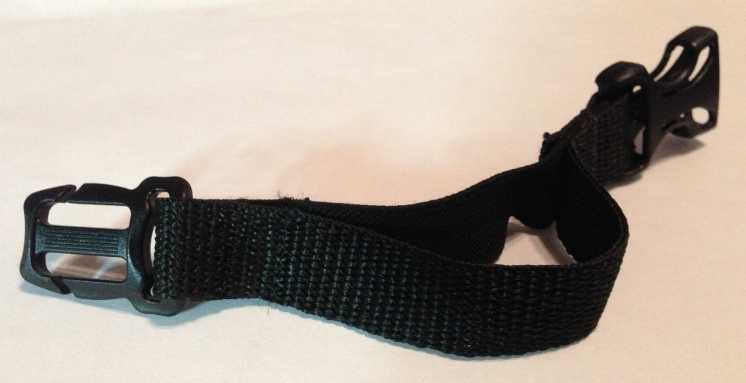 So I cut off the elastic and shortened that side of the strap so that the whistle-side could adjust tighter. My stitching is awful, but you get the idea. Just wanted to let you know about this change.